Oil on canvas, circa 1872. Private collection. The fascinating “Pissarro’s People” exhibit is a collaboration between the Legion of Honor in San Francisco and the Sterling and Francine Clark Art Institute in Williamstown, Mass. It is the first show to focus entirely on Pissarro’s figurative works, as opposed to his better-known rural and urban landscapes. In the 12 years while the exhibition was taking shape, the curators located the finest examples of Pissarro’s representational paintings, drawings, prints, mixed media and gouaches from international public and private collections, including those of Pissarro’s descendants. Many of the 100 selected works have never before been exhibited in the United States. 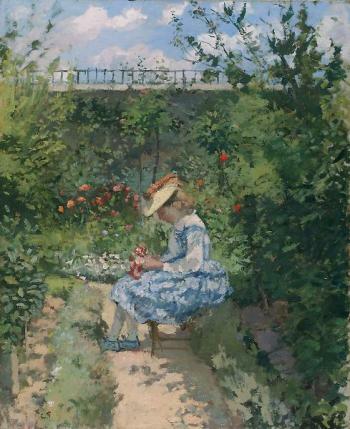 Camille Pissarro (1830–1903) was both an outsider and an insider to French Impressionist art. He was born to a Sephardic Jewish family on Danish-controlled St. Thomas. After studying in Paris as a boy, his interest in art became apparent. At 25, he left his home and the family business for France. Thereafter, Pissarro and his family lived in rural France, although he also frequented Paris. Pissarro never became a French citizen. Those fortunate enough to have seen last years’ blockbuster show, “Birth of Impressionism: Masterpieces from the Musée d’Orsay” at San Francisco’s De Young Museum (or elsewhere), will have noted how the Impressionists burst out of the more formal Salon paintings. Pissarro followed that pattern. One of his early teachers was the Salon artist Corot. He then abandoned the staid rules of the Salon for the freedom of Impressionism. “Pissarro’s People” is divided into segments, each of which explores a distinct aspect of the artist’s work. Early works concentrate on loving portraits of Pissarro’s immediate family, including his wife and their many children (see painting above). The exhibition contains several delicate drawings and paintings of St. Thomas. I was particularly attracted to the painting “Two Women Chatting by the Sea” (1856) for the grace and dignity Pissarro bestowed on the two young women with their washing. The background landscape completes Pissarro’s remembrance of life in St. Thomas. Pissarro’s portraits of workers and servants are notable, not only for their purely artistic qualities, but also for their support of labor. The portraits show various servants and workers peacefully doing their jobs, taking breaks, living their lives. “The Maid Servant” (1875) and “The Gardner-Old Peasant with Cabbage” (1883-1895) are two very successful portraits. These static images show more artistry and power than Pissarro’s somewhat awkward paintings and drawings of peasants in motion. As Pissarro became more involved in left-wing political and social causes, he embraced anarchism. He believed that only anarchy could bring about the dramatic political and societal change France needed — the elimination of property rights and class distinctions so that people could work collectively. “The Apple Pickers” (1886) is a fine example of rosy-cheeked workers in post-revolutionary harmony. Pissarro significantly influenced Cézanne and Gauguin, and, in turn, Pissarro was inspired by other Impressionists. His figurative works, rooted in his love of family and his left-wing politics, are explored and elucidated in this exhibition. One comes away from “Pissarro’s People” having gained a much greater understanding of the artist and his art.